The Supreme Court on Friday, 21st Jan 2010, upheld an Orissa High Court judgment that commuted the death sentence a trial court awarded to Dara Singh to life term. 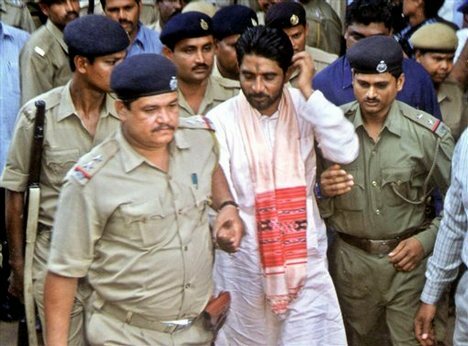 The court rejected CBI’s plea for death penalty to him. The bench comprising justices P Sathasivam and B S Chauhan delivered the verdict. Lawyer Minakshi Lekhi hailed the Supreme Court judgment “While burning someone to death is abhorable, at the same time converting an innocent tribal is also an abhorable act. I appreciate all the findings of the supreme court,” she said. Few others felt that judgement is lenient. Dara Singh, reacting to the verdict from Keonjhar district jail, told “All right. If it’s the verdict of country’s highest court, I accept it. My conscience says I am innocent. But I will go by the court order. My lawyers will decide the future course of action”. He declined to speak to the media. 54-year-old Dara has spent 11 years in different jails in Orissa since his arrest for the January 22, 1999 murders of Graham Staines and his two minor children at Manoharpur village in Keonjhar district. He leads the evening prayer inside the jail. He also helps us in guarding the premises. He is staying among more than 500 inmates, nearly 40 of whom are suspected Maoists. No one has ever complained against him. No special security is arranged for him including during occasions when he is taken to the court to face trial in cases.